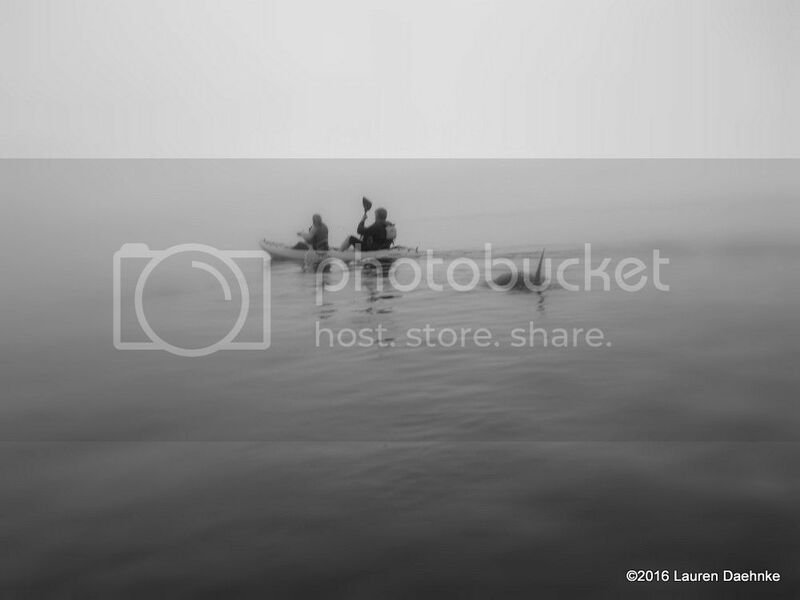 That's my aunt and uncle in the kayak. Mom took the picture. She claims she didn't even see it until she looked at the photo...which is hard to believe unless you know my mom. I don't think she has the photoshop skills to fake it. hmmm, Mola mola comes to mind. Fieldnotes wrote: hmmm, Mola mola comes to mind. Yes, that immediately came to mind for me too, simply because I know they're in Monterey Bay and I know they're funny-looking. I don't actually know what their profile above the water looks like though. Mola Mola doesn't seem right. Looks more Mammalia to me. Mola mola unlikely, the dorsum I think is too broad and dorsal is falcate, not straight. I think mammal, but not sure which, I saw the same or similar from the beach at Santa Cruz December 26, 2016. Whale shark unlikely and the dorsal fin too falcate, whale sharks unlikely in the relatively cool waters of Monterey Bay, although Basking sharks do show up especially in the summer. Maybe someone with a good marine mammal reference can help us narrow it down? When I observed them from the beach, they were near kayaks, I wonder if I saw your family? How about a Harbor Seal on it's side with the flipper vertical?That would explain the spots too. I agree with Harbor Seal, swimming towards the camera. Not much else is that "chunky", and they are playful around people. It was probably checking them out for fishing bait. Lots of folks in kayaks fish the bay there. There are plenty of otters there also. Nice insights! Perhaps we finally have a good candidate? No way that's a harbor seal. The thing that gets me about this creature is the separation from body to fin. It's a funny angle to be sure but there is something about it that doesn't make sense, otherwise I would go with Orca. If that is a dorsal fin that would be the only animal I can think. The other thing is if it surfaced to breath there would be no missing that sound. I would imagine it would have startled them. Other than that the only other thing I can think of is Big Eye Tuna or the like. Jonathan, do you know how far out in the Bay they were, and where they canoed out from, ie Santa Cruz, Monterey, or Moss Landing? My guess is the fin is the foreflipper of a California Sea Lion, and the spots are bits of water. I think the seal lion is doing a corkscrew dive, checking out the canoes. If this is a cetacean, the only likely candidates in the bay are Orca or a young Risso's Dolphin. I find it pretty unlikely either would surface just once, and no one would ever notice, or that either would be alone. Adult male orca sometimes travel alone, but... they have a six foot dorsal fin. I'm not seeing that. So, my guess is pinniped, mostly likely CA Sea Lion, or some sort of fish, perhaps a Mola at a funny angle, starting to flop over, as Mola are apt to do at the surface. Bottlenose Dolphins would be the most likely dolphin species to be viewable from the beach , and they are very common close to Monterey Bay beaches. I usually see them every fourth or fifth trip to the beach. This doesn't look right for Tursiops, though. The position of the "fin" seems odd. Still, it's another possibility if the the kayakers were near shore. JAMAUGHN wrote: Jonathan, do you know how far out in the Bay they were, and where they canoed out from, ie Santa Cruz, Monterey, or Moss Landing? My guess is the fin is the foreflipper of a California Sea Lion, and the spots are bits of water. I think the seal lion is doing a corkscrew dive, checking out the canoes. If this is a cetacean, the only likely candidates in the bay are Orca or a young Risso's Dolphin. I find it pretty unlikely either would surface just once, and no one would ever notice, or that either would be alone. Adult male orca sometimes travel alone, but... they have a six foot dorsal fin. I'm not seeing that. So, my guess is pinniped, mostly likely CA Sea Lion, or some sort of fish, perhaps a Mola at a funny angle, starting to flop over, as Mola are apt to do at the surface. They were out in Monterey Bay between Pacific Grove Beach and Cannery Row, a few hundred yards out just beyond the kelp line. My dad, who wasn't there and hasn't seen this thread, told me that he thinks it was a seal's flipper. Well, Sea Lions are more like dogs and much more agile in the water. Harbor seals are much fatter and not as agile at turning in the water. Harbor Seals are also spotted, slower moving, and do more rolling in the water as opposed to turning their whole bodies at angles. 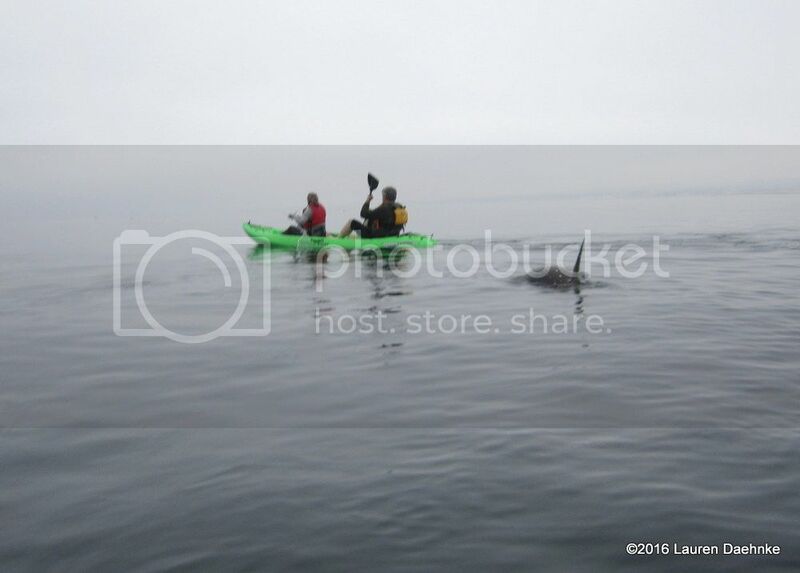 Actually the tail flippers closest to the kayak fit exactly with a Harbor Seal. Harbor seals are pretty common on the Pacific Coast. I have seen them while on fishing boats from San Diego to Eureka. They find a way to hop out and lay on navigational buoys. I agree with everything you're saying here, Craig, and it could well be a Harbor Seal. My only reason for preferring the Sea Lion ID is the length of the foreflipper. It just seems a little long for a Harbor Seal. Also, I've noticed that when Harbor Seals do that kind of jump-n'roll, they tend to tuck their foreflippers into their bodies, while Sea Lions stick them out. This isn't a hard and fast rule, though. For the record, I'm not seeing the tail flippers you're referring to. Either way, I think we're looking at a pinniped, here. Oh, and I should mention that at the spot Jonathan describes, both species, Harbor Seal and Sea Lion, are ridiculously abundant. I agree the top flipper seems long, but the two blobs at the far end on the sides of the animal to me resemble the powerful tail flippers of a Harbor seal. I bet it did scare the folks that never knew it was there. I wish they had seen it, it was trying to wave and say "Hi". The long flipper is why I settled on Sea Lion also. Definitely not a whale shark and molas bask horizontally when at the surface to thermo regulate. I’d say you have a pinniped with 99% certainty.